Shas leader Aryeh Deri says Mizrahit music star Omer Adam's commercial success is due to well-known refusal to perform on Shabbat. Shas Chairman and Interior Minister Aryeh Deri alleged that Mizrahit superstar Omer Adam's commercial success is due to his well-known refusal to perform on Shabbat. 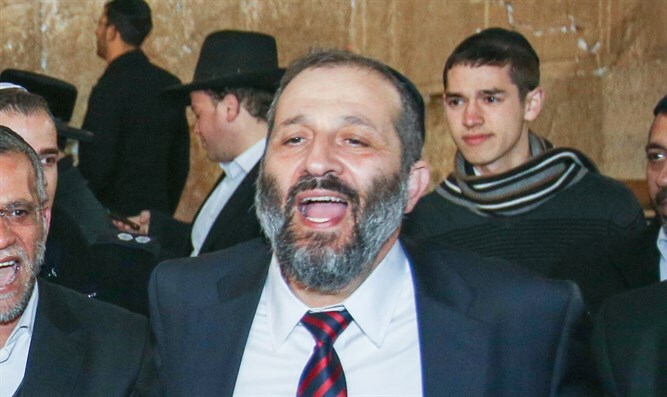 Before introducing Adam at a sold-out concert in Sderot earlier this week, Deri told that crowd that "I would like to thank him and congratulate him for being a proud Jew who does not appear on Shabbat! He succeeds thanks to the holy Sabbath!" Adam has consistently ranked among Israel's most popular singers recently, but has been making waves for his increasingly religious lifestyle. While Adam was known to be traditional, his newfound observance of Jewish law first became prominent after he refused to perform at a music festival on Hanukkah despite being offered 1 million shekels because he did not want to desecrate Shabbat. Despite event organizers doubling his salary, Adam reportedly said that "no amount of money will ever cause me to violate Shabbat." A growing number of secular Israeli artists have announced their unwillingness to perform on Shabbat in recent years, including Yuval Dayan, Keren Peles, and Natan Goshen.